Producer: Orson Welles; screenplay: Orson Welles, from the novel by Booth Tarkington; photography: Stanley Cortez; editor: Robert Wise; sound: Bailey Fesler and James G. Stewart; art director: Mark-Lee Kirk; music: Bernard Herrmann; special effects: Vernon L. Walker; costume designer: Edward Stevenson. Cast: Joseph Cotten ( Eugene Morgan ); Dolores Costello ( Isabel Amberson Minafer ); Anne Baxter ( Lucy Morgan ); Tim Holt ( George Minafer ); Agnes Moorehead ( Fanny Amberson ); Ray Collins ( Jack Amberson ); Richard Bennett ( Major Amberson ); Don Dillaway ( Wilbur Minafer ). Award: New York Film Critics' Award, Best Actress (Moorehead), 1942. Bessy, Maurice, Orson Welles , Paris, 1963; as Orson Welles , New York, 1971. McBride, Joseph, Orson Welles , London, 1972, 1996. Carringer, Robert L., The Magnificent Ambersons: A Reconstruction , Berkeley, 1993. Variety (New York), 1 July 1942. "Controversy with RKO," in Time (New York), 20 July 1942. Newsweek (New York), 20 July 1942. Times (London), 5 March 1943. Revue du Cinéma (Paris), December 1946. Castello, G. C., "The Magnificent Orson Welles," in Bianco e Nero (Rome), January 1949. Prouse, Derek, "Notes on Film Acting," in Sight and Sound (London), Spring 1955. "Agnes Moorehead," in Sight and Sound (London), Autumn 1955. Pariante, Roberto, "Orson Welles from Citizen Kane to Othello," in Bianco e Nero (Rome), March 1956. Cahiers du Cinéma (Paris), September 1958. Stanbrook, Alan, "The Heroes of Welles," in Film (London), no. 26, 1961. "Welles Issue" of Cine Forum (Venice), no. 19, 1962. Bowers, Ronald, "Agnes Moorehead," in Films in Review (New York), May 1966. "Welles Issue" of Film Comment (New York), Summer 1971. Smith, J., "Orson Welles and the Great American Dummy; or, The Rise and Fall and Regeneration of Benjamin Franklin's Model American," in Literature/Film Quarterly (Salisbury, Maryland), Summer 1974. Vialle, G., in Image et Son (Paris), no. 308 bis, 1976. Schwartz, H., "An American Film Institute Seminar with Stanley Cortez, ASC," in American Cinematographer (Los Angeles), November 1976. Passler, Susan Karnes, in Magill's Survey of Cinema 3 , Englewood Cliffs, New Jersey, 1980. Kalinak, Kathryn, "The Text of Music: A Study of The Magnificent Ambersons ," in Cinema Journal (Austin), vol. 27, no. 4, Summer 1988. Nielsen, N. A., "Et allerhelvedes perspekitv," in Kosmorama (Copenhagen), Fall 1989. Rochester, D., "Compelling Evidence," in American Film , vol. 15, no. 3, December 1989. Doherty, Jim, " The Magnificent Ambersons ," in Soundtrack (Mechelen), vol. 9, no. 36, December 1990. Cunningham, S., " The Magnificent Ambersons: Deep Focus, the Long Take and Psychological Representation," in Continuum , vol. 5, no. 2, 1992. Pernod, P., in Positif (Paris), July-August 1992. La Polla, F., "Welles e la frequentazione delle tenebre," in Quaderni di Cinema (Florence), July-September 1992. Bogdanovich, P., "En magnifik massaker," in Chaplin (Stockholm), no. 3, 1993. Rosenbaum, Jonathan, "Pages from the Endfield File," in Film Comment (New York), vol. 29, no. 6, November-December 1993. Wojahn, D., "Beginning in Las Vegas," in Michigan Quarterly Review , vol, 35, no. 1, 1996. "The Construction of Space and the Monstrous-Feminine in the Welles-Text," in Critical Survey , vol. 10, no. 2, May 1998. The Magnificent Ambersons has been called Orson Welles's near-masterpiece, second to Citizen Kane . That qualified description derives more from the fact that the film was "butchered" by RKO, rather than from any intrinsic shortcoming on the part of its director. Following the financial disaster of Kane , RKO executives compelled Welles to choose as his next film a subject with commercial appeal. Welles wanted to film The Pickwick Papers with W. C. Fields but Field's schedule would not permit it. As Booth Tarkington was a favorite novelist of Welles, he selected instead the author's 1919 Pulitzer Prize-winning novel about the decline and fall of an aristocratic family brought on by the encroaching industrial revolution at the turn of the century. Welles had already presented a radio version of the novel in 1939 starring himself and Walter Huston. Welles wrote the script in nine days, deleting much of Tarkington's sentimentality, and with a Proustian remembrance of a life of gentility now past, concentrated on the psychological darkness which destroyed the Amberson clan. His was a literary rendering of what was essentially a second-rate novel, a lament, he says, "not so much for an epoch as for the sense of moral values which are destroyed." 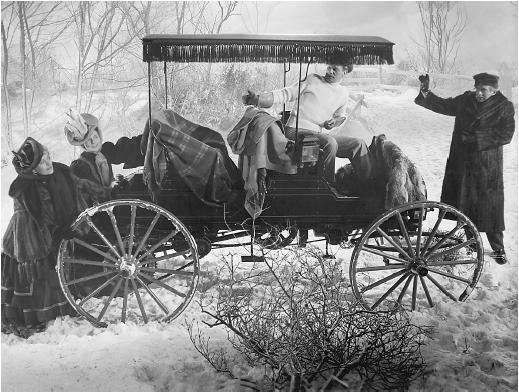 The film centers on the ill-fated love between the gentlemanly horseless carriage manufacturer Eugene Morgan and the exquisitely beautiful Amberson matriarch, Isabel; the reaction of her spoiled son George Minafer, whose "come-uppance" eventually transpires; and the fate of neurotic spinster aunt Fanny Minafer. Welles's completed version ran 148 minutes which he reduced to 131. RKO then sent him to Brazil to direct the aborted It's All True and proceeded to edit the film to 88 minutes, including the insertion of the hospital scene at the end. This scene had not been written by Welles and was directed by Freddie Flick and scored by Roy Webb, instead of Bernard Herrmann whose haunting score is so essential a part of the film. This truncated version, says Welles, destroyed "the whole heart of the picture really." Nevertheless what remains is a luxuriant motion picture combining Welles's unique directorial flair with what Jean Cocteau called "calm beauty." The beginning of the film provides a picture of a bygone era with its good humor and homey virtues, after which Welles slowly and deliberately unmasks the Ambersons' imperfections. The dramatic use of light and shadow in Stanley Cortez's deep-focus photography accentuates and enhances the characters' conflicts. Welles employed a nostalgic irising in and out to begin and end scenes, and he edited the film in the camera—scene by scene, vignette by vignette—rather than relying on the cutting room after the fact. He spoke the voice-over narration himself, a skill honed through his vast experience with radio, a narration he likened to the titles in silent films. He also incorporated overlapping dialogue and street noises as part of the sound track and used groupings of the townspeople in the film as a Greek chorus, whose chattering, gossipy observations of the vicissitudes of the Amberson-Morgans provided succinct commentary and embellished the storyline. Paramount to the success of Ambersons is the excellent acting. Welles worked meticulously with his cast. Using his script as a guide, he discussed their characters with the actors, rehearsed them at length and then shot the scenes, often allowing them to improve the actual dialogue based on their understanding of their parts. The cast constituted a first-rate ensemble with Joseph Cotten a standout as the gentle, suave Eugene, though the acting honors unequivocally belong to Agnes Moorehead. Her virtuoso performance is one of the finest on the American screen and earned her the New York Film Critics Award. Reviews of Ambersons were less than enthusiastic. Many seemed to expect a depiction of the typical family wrapped in sugar-spun Americana, rather than the in-depth analysis which revealed warts and all. The New York Times opined that Welles had wasted his abundant talents on "a relentlessly somber drama on a barren theme." The picture was not the commercial success that RKO had hoped for and it was well over a decade before the film was received and appreciated for the master stroke it is.